Rise above it all (sometimes useful advice with a family). Just for fun or for a real challenge, learn to balance or walk while suspended in mid-air. Find out who the monkeys are in your group. Having difficulty getting your teenagers away from their screens? It can be so frustrating. Why not take them into a nice forest? No, not to lose them! This is not that kind of wood. But to scramble from tree to tree together. You go from platform to platform, perched several metres above the ground, in complete safety. 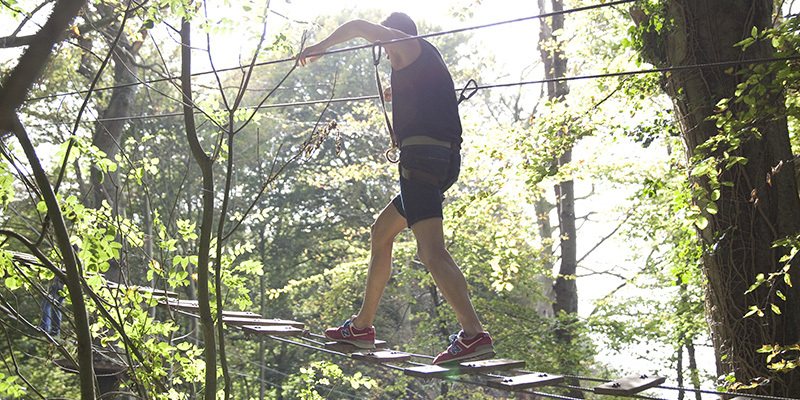 The zip lines follow one after the other (including a giant one 75 metres long), and there are also moving bridges, rope bridges and rope walkways. It is sporty without being too intense. You develop your balance while being at one with nature and the trees. If you’re the competitive type, take our timed course and see how high you rank. Young kids will love the aero-jump that lets them do leaps of almost 10 metres. Like a jumping bean! And we haven’t forgotten your babes-in-the-wood, they can have fun on the baby trail. After this excursion in the trees, come back down to earth with a round of golf. The mini-golf course is ready and waiting.